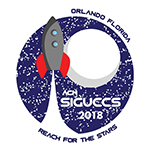 SIGUCCS is an Association for Computing Machinery (ACM) Special Interest Group on University and College Computing Services. ACM SIGUCCS conference events and activities focus on the issues surrounding the support, delivery, and management of college and university information technology services. The conference format provides members and those in the field of college and university IT support a wide variety of learning and professional development opportunities. Sessions take a variety of formats, offering you an opportunity for various kinds of learning and networking. Presentation – standard presentation format with opportunity for question and answer. Presentations are 60 or 90 minutes in length. Panel – these sessions focus around a topic of interest; presenters offer insight and lead discussion around that topic. Panels typically are 90 minute sessions. Poster – an open forum where multiple topics are presented in poster format and authors are available to answer questions in a one-on-one setting. Lightning Talks – This is a form of group presentation where each member of a small group (approximately 5) is allocated 7 minutes to make a concise presentation on a specific, yet unrelated, topic. Two minutes of Q&A follows each presenter with an additional 15 minutes for questions directed to any presenters in the group at the end of the session. This is an opportunity for new attendees to take the first step to participate in a professional conference and gain valuable experience presenting as well as an option for seasoned attendees presenting at the conference to share quick tips and useful information without compiling a second paper. Networking Events – informal networking opportunities based on IT topics, offering you the opportunity to meet people using similar technologies or facing similar issues on their campuses. If you are being harassed, notice that someone else is being harassed, or have any other concerns, please reach out to chair_SIGUCCS@acm.org or vc_SIGUCCS@acm.org. They will promptly address the issue and report it to the ACM Chief Operating Officer (COO) (coo@acm.org).